Not to be confused with chemical borium or elements boron (B) or barium (Ba). Two groups claimed discovery of the element. Evidence of bohrium was first reported in 1976 by a Soviet research team led by Yuri Oganessian, in which targets of bismuth-209 and lead-208 were bombarded with accelerated nuclei of chromium-54 and manganese-55 respectively. Two activities, one with a half-life of one to two milliseconds, and the other with an approximately five-second half-life, were seen. Since the ratio of the intensities of these two activities was constant throughout the experiment, it was proposed that the first was from the isotope bohrium-261 and that the second was from its daughter dubnium-257. Later, the dubnium isotope was corrected to dubnium-258, which indeed has a five-second half-life (dubnium-257 has a one-second half-life); however, the half-life observed for its parent is much shorter than the half-lives later observed in the definitive discovery of bohrium at Darmstadt in 1981. The IUPAC/IUPAP Transfermium Working Group (TWG) concluded that while dubnium-258 was probably seen in this experiment, the evidence for the production of its parent bohrium-262 was not convincing enough. 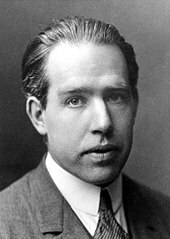 In September 1992, the German group suggested the name nielsbohrium with symbol Ns to honor the Danish physicist Niels Bohr. The Soviet scientists at the Joint Institute for Nuclear Research in Dubna, Russia had suggested this name be given to element 105 (which was finally called dubnium) and the German team wished to recognise both Bohr and the fact that the Dubna team had been the first to propose the cold fusion reaction to solve the controversial problem of the naming of element 105. The Dubna team agreed with the German group's naming proposal for element 107. There was an element naming controversy as to what the elements from 104 to 106 were to be called; the IUPAC adopted unnilseptium (symbol Uns) as a temporary, systematic element name for this element. In 1994 a committee of IUPAC recommended that element 107 be named bohrium, not nielsbohrium, since there was no precedence for using a scientist's complete name in the naming of an element. This was opposed by the discoverers as there was some concern that the name might be confused with boron and in particular the distinguishing of the names of their respective oxyanions, bohrate and borate. The matter was handed to the Danish branch of IUPAC which, despite this, voted in favour of the name bohrium, and thus the name bohrium for element 107 was recognized internationally in 1997; the names of the respective oxyanions of boron and bohrium remain unchanged despite their homophony. 278Bh 11.5 min? SF 1998? 290Fl(e−,νe3α)? Bohrium has no stable or naturally occurring isotopes. Several radioactive isotopes have been synthesized in the laboratory, either by fusing two atoms or by observing the decay of heavier elements. Twelve different isotopes of bohrium have been reported with atomic masses 260–262, 264–267, 270–272, 274, and 278, one of which, bohrium-262, has a known metastable state. All of these but the unconfirmed 278Bh decay only through alpha decay, although some unknown bohrium isotopes are predicted to undergo spontaneous fission. The lighter isotopes usually have shorter half-lives; half-lives of under 100 ms for 260Bh, 261Bh, 262Bh, and 262mBh were observed. 264Bh, 265Bh, 266Bh, and 271Bh are more stable at around 1 s, and 267Bh and 272Bh have half-lives of about 10 s. The heaviest isotopes are the most stable, with 270Bh and 274Bh having measured half-lives of about 61 s and 40 s respectively, and the even heavier unconfirmed isotope 278Bh appearing to have an even longer half-life of about 690 s.
The proton-rich isotopes with masses 260, 261, and 262 were directly produced by cold fusion, those with mass 262 and 264 were reported in the decay chains of meitnerium and roentgenium, while the neutron-rich isotopes with masses 265, 266, 267 were created in irradiations of actinide targets. The five most neutron-rich ones with masses 270, 271, 272, 274, and 278 (unconfirmed) appear in the decay chains of 282Nh, 287Mc, 288Mc, 294Ts, and 290Fl respectively. These eleven isotopes have half-lives ranging from about ten milliseconds for 262mBh to about one minute for 270Bh and 274Bh, extending to about twelve minutes for the unconfirmed 278Bh, one of the longest-lived known superheavy nuclides. The longer-lived heavy isotopes of bohrium, produced as the daughters of heavier elements, offer advantages for future radiochemical experiments. Although the heavy isotope 274Bh requires a rare and highly radioactive berkelium target for its product, the isotopes 272Bh, 271Bh, and 270Bh can be readily produced as daughters of more easily produced moscovium and nihonium isotopes. ^ a b Johnson, E.; Fricke, B.; Jacob, T.; Dong, C. Z.; Fritzsche, S.; Pershina, V. (2002). "Ionization potentials and radii of neutral and ionized species of elements 107 (bohrium) and 108 (hassium) from extended multiconfiguration Dirac–Fock calculations". The Journal of Chemical Physics. 116: 1862. Bibcode:2002JChPh.116.1862J. doi:10.1063/1.1430256. ^ a b c d e f g h i j k l m n Hoffman, Darleane C.; Lee, Diana M.; Pershina, Valeria (2006). "Transactinides and the future elements". In Morss; Edelstein, Norman M.; Fuger, Jean (eds.). The Chemistry of the Actinide and Transactinide Elements (3rd ed.). Dordrecht, The Netherlands: Springer Science+Business Media. ISBN 1-4020-3555-1. ^ a b c d Fricke, Burkhard (1975). "Superheavy elements: a prediction of their chemical and physical properties". Recent Impact of Physics on Inorganic Chemistry. 21: 89–144. doi:10.1007/BFb0116498. Retrieved 4 October 2013. ^ FUSHE (2012). "Synthesis of SH-nuclei". Retrieved August 12, 2016. ^ a b c Münzenberg, G.; Hofmann, S.; Heßberger, F. P.; Reisdorf, W.; Schmidt, K. H.; Schneider, J. H. R.; Armbruster, P.; Sahm, C. C.; Thuma, B. (1981). "Identification of element 107 by α correlation chains". Zeitschrift für Physik A. 300 (1): 107–8. Bibcode:1981ZPhyA.300..107M. doi:10.1007/BF01412623. Retrieved 24 December 2016. ^ a b c "Names and symbols of transfermium elements (IUPAC Recommendations 1997)". Pure and Applied Chemistry. 69 (12): 2471. 1997. doi:10.1351/pac199769122471. ^ "Names and symbols of transfermium elements (IUPAC Recommendations 1994)". Pure and Applied Chemistry. 66 (12): 2419. 1994. doi:10.1351/pac199466122419. ^ International Union of Pure and Applied Chemistry (2005). Nomenclature of Inorganic Chemistry (IUPAC Recommendations 2005). Cambridge (UK): RSC–IUPAC. ISBN 0-85404-438-8. pp. 337–9. Electronic version. ^ Nelson, S.; Gregorich, K.; Dragojević, I.; Garcia, M.; Gates, J.; Sudowe, R.; Nitsche, H. (2008). "Lightest Isotope of Bh Produced via the Bi209(Cr52,n)Bh260 Reaction" (PDF). Physical Review Letters. 100 (2): 022501. Bibcode:2008PhRvL.100b2501N. doi:10.1103/PhysRevLett.100.022501. PMID 18232860. ^ Münzenberg, G.; Armbruster, P.; Hofmann, S.; Heßberger, F. P.; Folger, H.; Keller, J. G.; Ninov, V.; Poppensieker, K.; et al. (1989). "Element 107". Zeitschrift für Physik A. 333 (2): 163. Bibcode:1989ZPhyA.333..163M. doi:10.1007/BF01565147. ^ Hofmann, S.; Ninov, V.; Heßberger, F. P.; Armbruster, P.; Folger, H.; Münzenberg, G.; Schött, H. J.; Popeko, A. G.; Yeremin, A. V.; Andreyev, A. N.; Saro, S.; Janik, R.; Leino, M. (1995). "The new element 111". Zeitschrift für Physik A. 350 (4): 281. Bibcode:1995ZPhyA.350..281H. doi:10.1007/BF01291182. ^ Gan, Z.G. ; Guo, J. S.; Wu, X. L.; Qin, Z.; Fan, H. M.; Lei, X. G.; Liu, H. Y.; Guo, B.; et al. (2004). "New isotope 265Bh". The European Physical Journal A. 20 (3): 385. Bibcode:2004EPJA...20..385G. doi:10.1140/epja/i2004-10020-2. ^ a b Wilk, P. A.; Gregorich, K. E.; Turler, A.; Laue, C. A.; Eichler, R.; Ninov V, V.; Adams, J. L.; Kirbach, U. W.; et al. (2000). "Evidence for New Isotopes of Element 107: 266Bh and 267Bh" (PDF). Physical Review Letters. 85 (13): 2697–700. Bibcode:2000PhRvL..85.2697W. doi:10.1103/PhysRevLett.85.2697. PMID 10991211. ^ a b c Oganessian, Yu. Ts. (2007). "Heaviest Nuclei Produced in 48Ca-induced Reactions (Synthesis and Decay Properties)". In Penionzhkevich, Yu. E.; Cherepanov, E. A. (eds.). AIP Conference Proceedings: International Symposium on Exotic Nuclei. 912. p. 235. doi:10.1063/1.2746600. ISBN 978-0-7354-0420-5. ^ Münzenberg, G.; Gupta, M. (2011). "Production and Identification of Transactinide Elements". In Vértes, Attila; Nagy, Sándor; Klencsár, Zoltán; Lovas, Rezső G.; Rösch, Frank (eds.). Handbook of Nuclear Chemistry: Production and Identification of Transactinide Elements. p. 877. doi:10.1007/978-1-4419-0720-2_19. ISBN 978-1-4419-0719-6. ^ Malmbeck, R.; Skarnemark, G.; Alstad, J.; Fure, K.; Johansson, M.; Omtvedt, J. P. (2000). "Chemical Separation Procedure Proposed for Studies of Bohrium". Journal of Radioanalytical and Nuclear Chemistry. 246 (2): 349. doi:10.1023/A:1006791027906. ^ Gäggeler, H. W.; Eichler, R.; Brüchle, W.; Dressler, R.; Düllmann, Ch. E.; Eichler, B.; Gregorich, K. E.; Hoffman, D. C.; et al. (2000). "Chemical characterization of bohrium (element 107)". Nature. 407 (6800): 63–5. Bibcode:2000Natur.407...63E. doi:10.1038/35024044. PMID 10993071. ^ Eichler, R.; et al. "Gas chemical investigation of bohrium (Bh, element 107)" (PDF). GSI Annual Report 2000. Archived from the original (PDF) on 2012-02-19. Retrieved 2008-02-29.